We finally got our Evo experience stuff framed and hung up – and when I say "we" I mean Jonna. 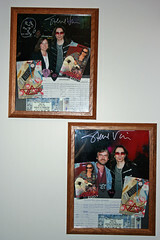 This entry was posted in Flickr Picks and tagged autographs, concerts, evo-experience, memorabilia, steve-vai by Ron Bieber. Bookmark the permalink.